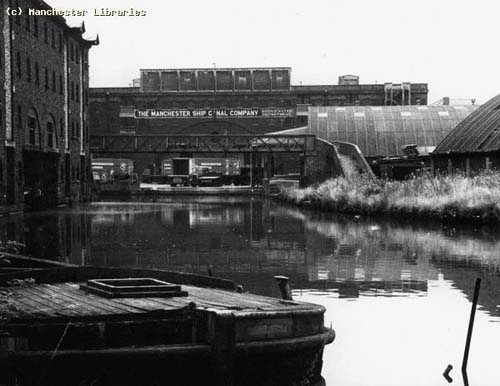 Looking at old photos of the canal in the city centre of Manchester, the industry, the grime, the sheer Dickensian background, you’d never think that it would have the potential to produce the fish of a lifetime for a local angler -a huge beautiful leviathan of the aquatic world, a 5 foot long sleek powerful predator – the apex predator of the waterways. 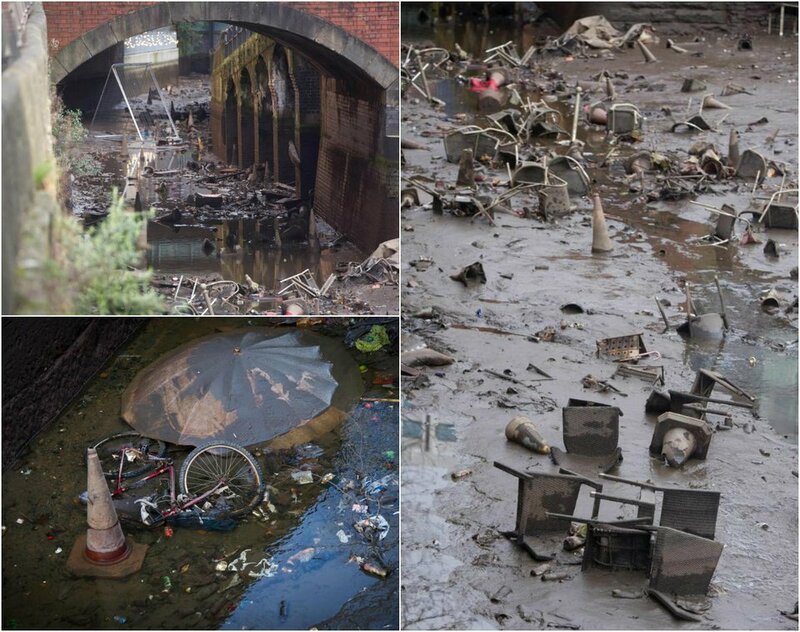 Indeed – when sections of our local canals get drained down to allow for repairs to take place, you’d scarcely believe that anything could live among the filth and debris that us humans throw into their murky waters. 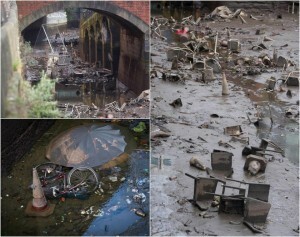 Despite its outwardly looking murky grey appearance, the shopping trollies, traffic cones, chairs, bikes and umbrellas, the source of the waters for our local canals comes from high up on the hills and moors above Littleborough and Saddleworth – and is some of the cleanest water in the country. Untainted by the pollution of our cities, industries and the poor agricultural practices of our nations farmers – it flows like a clean bright ribbon through the centre of our city. Anglers have known this for years, and are aware that our local canals, the Rochdale, the Ashton , and the Bridgewater are fantastic fisheries, stuffed with species of fish such as Roach, Perch, Rudd, Tench, Bream, Gudgeon and Carp…. an angling mecca. These clean water corridors also act as nature superhighways through our suburbs and city centres. They’re ribbons of high quality habitat allowing nature such as Kingfishers, Otters, Herons, Water Voles and Dippers to make their homes and thrive in the most unlikely urban locations. 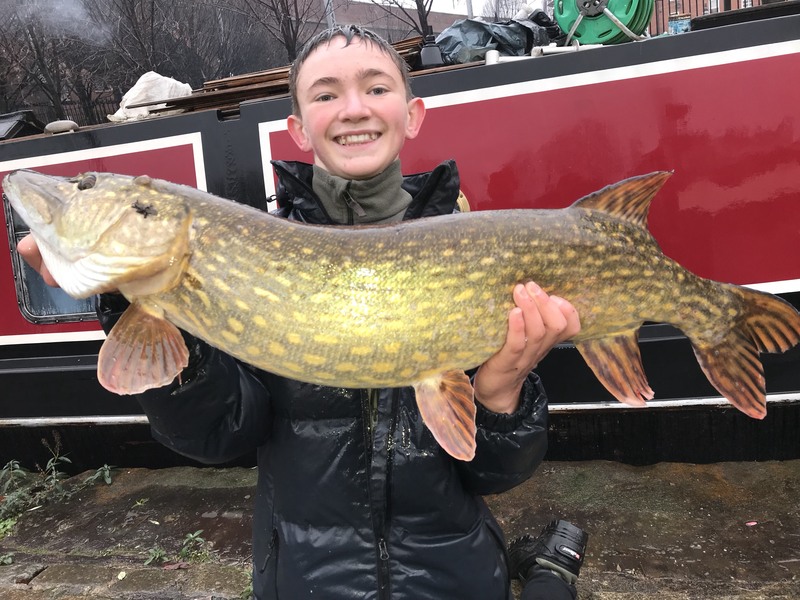 At the top of the food chain in this watery sometimes murky ecosystem is a super apex predator Esox Lucius – commonly known as the Pike. Huge numbers of small jack pike live in our canals – in many areas comprising over 10% of the canals biomass. Rarely exceeding a couple of feet in length they are greedy customers for anglers worms and lures its not too difficult to catch up to a dozen in an afternoons fishing if you know what your about and the conditions are right… However catching the bigger, wiser older Pike who prey on the jack pike is an altogether different task. 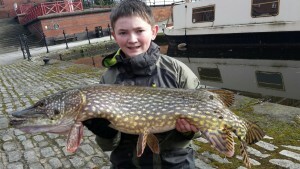 A 20lb Pike from a Greater Manchester canal is a real specimen,,,, the fish of a lifetime. 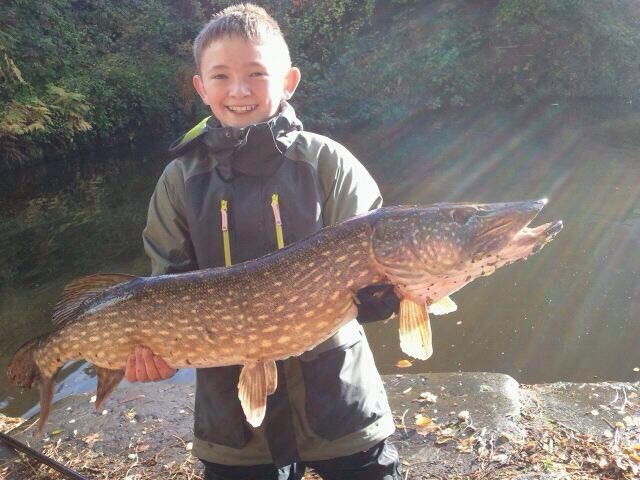 The vast majority of our regions thousands of anglers have never seen a 20lb pike let alone caught one. One or two might be lucky or sufficiently skilled to tempt one of these huge underwater leviathans – most probably from a larger river or lake where the Pike have the space to grow large… but catching one from a canal is the challenge of a lifetime, and a serious undertaking in terms of time and planning. Catching two of these supersized fish is a special achievement – something that garners the respects of your angling peers. Catching three is something most anglers could ever dream about.. 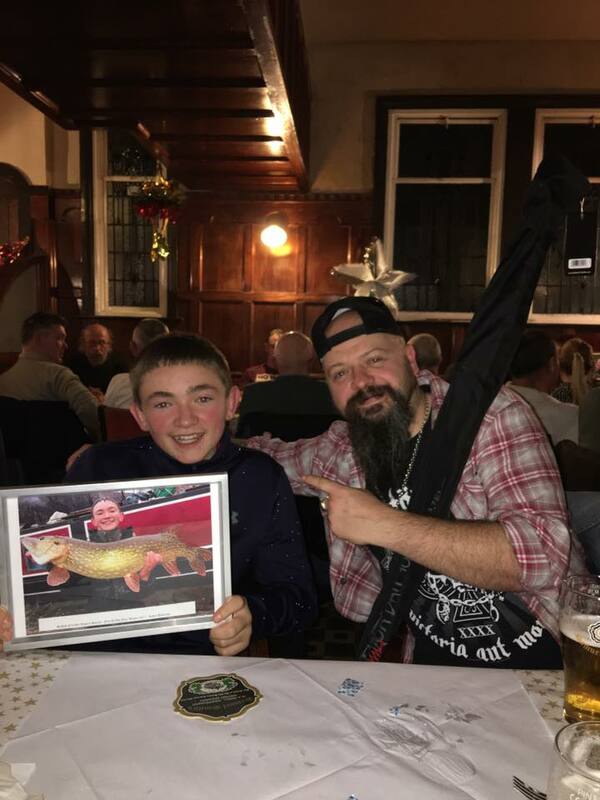 But catching four – then you quite rightly achieve an inconic status and are revered, acclaimed and envied by anglers on a national basis. 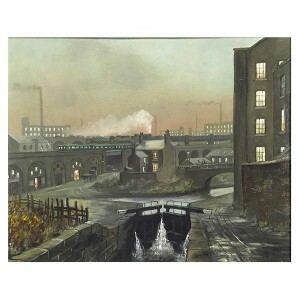 This leads us to young Kaden McCarthy – a 14 year old boy from an inner city estate in Salford. 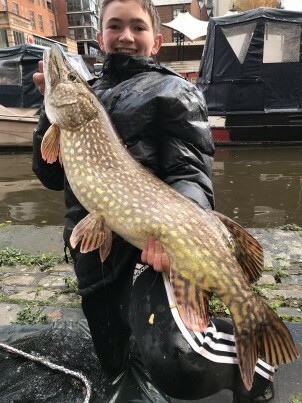 Kaden sent me this photo today – of yet another remarkable pike he has caught in the canal that runs through city centre Manchester. A fantastic specimen fish – the Pike of a lifetime for mere mortal anglers. 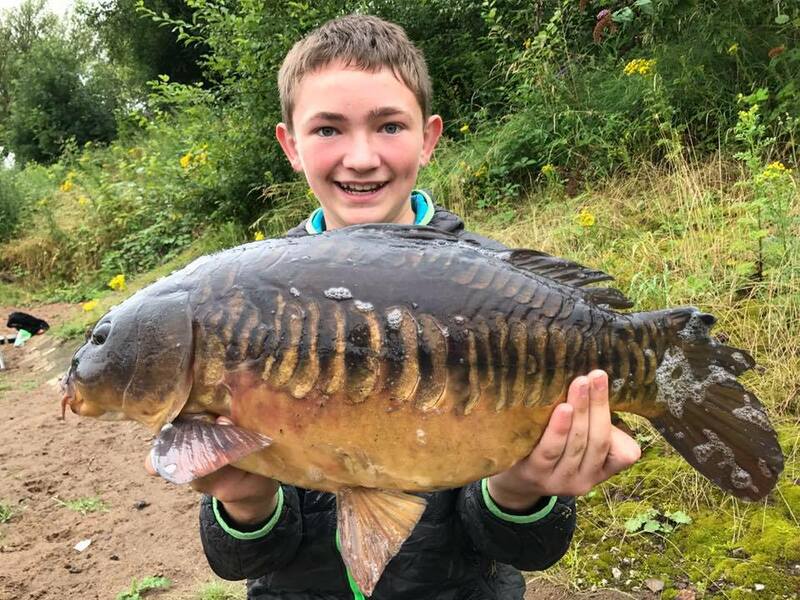 However young Kaden has developed into a special angler, with ability and instinct far beyond his 14 years. He has a developed a special aptitude for catching big fish from Manchester waterways. 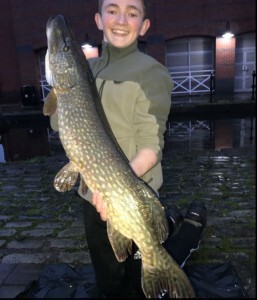 Heres a picture (below) of another monster Pike he caught last year in Manchester City Centre – which gave him the accolade of being the youngest angler to win the prestigious Salford Friendly Anglers “Fish Of The Year” award in 2016. 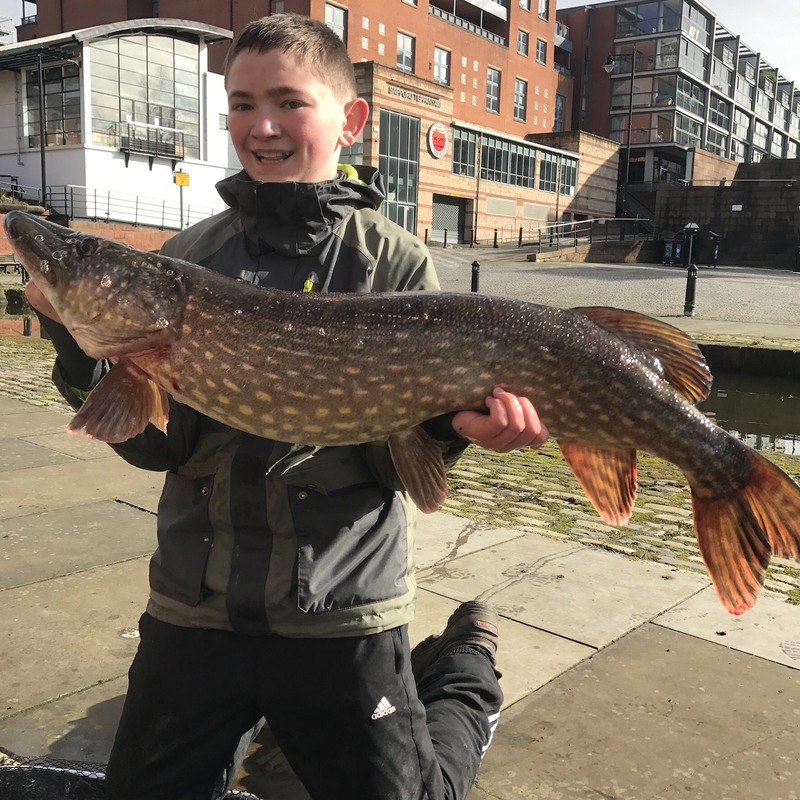 And then sandwiched between the capture of these two huge pike – he has managed to catch two more – taking his total of 20lb+ pike to the mystical 4 – A remarkable achievement for someone so young. 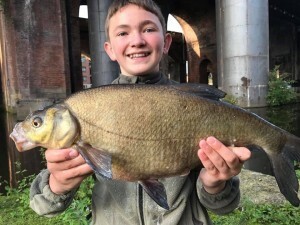 But the story regarding this young anglers abilities is still far from completely told…..
Like this bream, again a great fish from an urban canal, and this carp from the River Irwell. 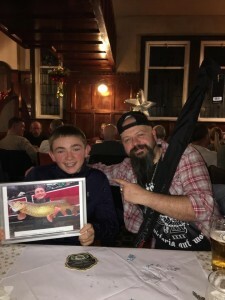 So — This article was written in November 2017 – and only a couple of weeks later in December – our young angler caught this great fish from the canal system in the city centre of Manchester..
What a belter – and a week later Kaden was rewarded by becoming the first angler ever to with the prestigious Salford Friendly Anglers Society Fish Of The Year Competition for a second time…… he attended the societies annual Xmas dinner and was presented with a new pike fishing rod as his prize by Sky TV Angling Expert Ant Glascoe Jnr…..
We all wait to see what this young angling prodigy is going to do next ! !